Apex Legends briefly punished repeat quitters but Respawn doesn't know "if or when this would come out for real"
Ever since Apex Legends launched there's been nothing but decency and respect to keep players from abandoning their squadmates in the middle of a match, and we all know how far decency and respect go on the internet. Now Respawn Entertainment has confirmed it's working on some methods for deterring the match-leaving ways of certain salty so-and-sos - though it stopped short of confirming when (or even if) they'll actually be implemented. 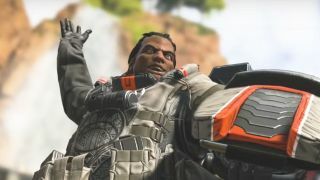 After the most recent major patch for Apex Legends, players noticed that the game would give them a five-minute timeout if they quit in the middle of three matches in quick succession (via Game Informer). Plus, you wouldn't be penalized for leaving early if your squad wasn't full (probably because somebody else left) or if you were eliminated. It sounds like a good compromise between discouraging bad sports - who can ruin a match for the teammates they desert, since everybody really counts in squads of three - and allowing some leeway for players who crash, lose their internet connection, or have to respond to a real-life situation. However, Respawn Entertainment community manager Jay Frechette revealed on Reddit that this new leave-punishing system wasn't meant to go live. Respawn had been testing it out internally, but an oversight in the patch caused it to go into effect on public servers as well. This was quickly rectified with another update, and Frechette added that "we don't have an ETA for if or when this would come out for real". It's funny that leaver-punishing would first arrive in Apex via oversight, as its absence has felt like an oversight from the beginning. In my anecdotal experience, quitters have only gotten worse since launch. Hopefully Respawn Entertainment can at least use the feedback from this slip-up to help out with plans for a more permanent solution; Apex Legends is so fun to play that it's a real bummer having so many matches spoiled by inconsiderate teammates. Or if your teammate just goes AFK, you could always literally carry them to victory. You may want to watch our video guide on how to win with Wraith first though.